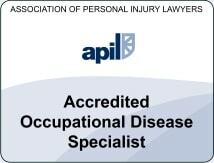 Latest information about claiming compensation for Pleural Plaques and Asbestos Scarring. It is not currently possible to claim for pleural plaques if exposure to asbestos occurred in England or Wales. However, it may be possible to claim in the future if legislation is changed. If exposure to asbestos occurred in Scotland you may now claim compensation for Pleural Plaques (see below). For the rest of the UK, you can claim compensation for pleural thickening and other asbestos related diseases. If you have been recently diagnosed with pleural plaques, you can still call us for advice on the options available - you may be entitled to compensation from the government under the Pneumoconiosis Act of 1979. The following is a brief summary of the ongoing pleural plaques debate from the House of Commons, House of Lords and Scottish Parliament . . .
A House of Lords ruling which stated compensation could not be claimed for pleural plaques has been overturned by a new law passed recently by the Scottish Parliament. Hundreds of Scots (many of them Clydeside shipyard workers) have been diagnosed with more serious asbestos diseases such as Asbestos Lung Cancer and Mesothelioma. The Damages Bill (Asbestos-related Conditions) (Scotland) was recently passed by 98 votes to 16. The bill only applies where exposure to asbestos happened in Scotland, the Lords judgement will still apply in England and Wales. The Law Lords had ruled that pleural plaques, a benign scarring of the lungs, are only an indication that there has been exposure to asbestos and should not be open to compensation claims as it had no symptoms and was not a disease. Pleural plaques do not develop into or cause more serious asbestos-related conditions, however, due to the exposure to asbestos, they do indicate an increased risk of developing mesothelioma. At Holyrood, there was cross-party support for the bill inspite of an earlier warning from the parliament's justice committee that the Government in Scotland may have to pay out millions in compensation to former naval shipyard employees who had been exposed to asbestos. It was claimed by The Association of British Insurers that passing the pleural plaques bill would send out the wrong message about the seriousness of the condition. Professor Anthony Seaton, who treats patients with asbestos related diseases, claimed that people diagnosed with pleural plaques could be confused by their doctors who failed to clarify the benign nature of their condition. Pleural plaques are scarrings on the lungs caused by asbestos exposure. It is accepted as an asymptomatic condition which is a clear indication of significant asbestos exposure. Pleural plaque victims have an increased risk of developing more serious asbestos diseases such as pleural thickening, asbestosis, asbestos related lung cancer or mesothelioma. The risk of developing a more serious asbestos condition in the future may cause pleural plaque victims to develop psychological symptoms. He could accept provisional damages for pleural plaques of around £4,000, with the option of returning to court if more serious asbestos related conditions developed at a later date. Or if he wanted to settle on a full and final basis he could accept between £7,000 and £10,000. There was a 2:1 majority verdict from the Court of Appeal that pleural plaques did not give rise to any physical symptoms and did not amount to anything more than minimal damage so victims of pleural plaques were unable to establish a cause of action. If there was a diagnosis of pleural thickening, the Court also ruled that if the condition was asymptomatic damages could not be sought. Mr Rothwell developed irritable bowel syndrome as a result of a recognised psychiatric illness from which he suffered. Once more, the Court stated that the defendants were not liable because it was not foreseeable that this type of psychiatric damage could occur in someone of normal fortitude. If the judgment is upheld in the House of Lords, the insurance industry estimated it would save around £1.4 billion in pleural plaque claims. Please contact us if you have any questions. We will still assess your claim and contact you if it is possible to claim for Pleural Plaques after the court of appeal. Call us on Free Phone: 0800 923 0046 and ask for Kathy Cooke or Warren Miller.